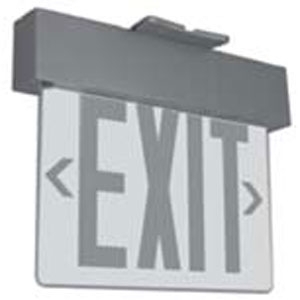 The EDGU Universal Edge-Lit Exit Sign is a slim, easy-to-install unit utilizing highly-efficient LEDs with ultra-bright diodes. This reliable and cost-efficient unit is ideal for any commercial or industrial application where high performance and contemporary design is required. Available in single or double-face for ceiling or wall mount. Includes canopy. Test switch and indicator light located at end of unit. 6” letters are standard. To meet various local codes, units are also available with optional green letters, 8” letters, or flashers, when required. Automatic low-voltage disconnect, brownout protection. Emergency models are provided with solid-state charging system and maintenance-free lead calcium batteries. Anodized extruded aluminum housing. Clear acrylic face is standard. Optional white or mirrored face available. 25 year life expectancy and utilizes only 3W. 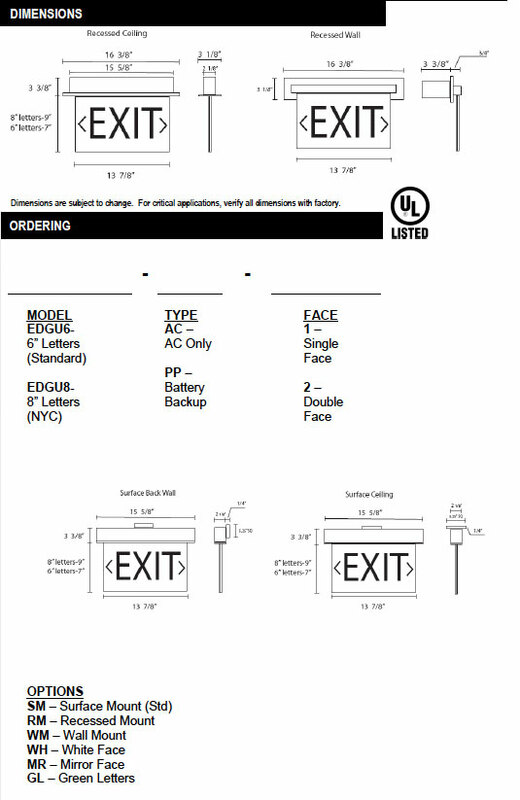 All units are universal voltage.